Italian Prime Minister Enrico Letta is battling to get his government and economic program back on track after Silvio Berlusconi withdrew his support for the coalition. Italian markets were jolted Monday by the weekend collapse of the country's coalition government after just five months, but the chance that early elections could be averted kept losses in check. Silvio Berlusconi withdrew his support for a grand coalition led by Prime Minister Enrico Letta, just a week before a parliamentary committee was due to vote on expelling the convicted fraudster from the Senate. Milan's benchmark index fell 1.8%, and the yield on Italy's 10-year bonds rose 18 basis points to 4.6%. 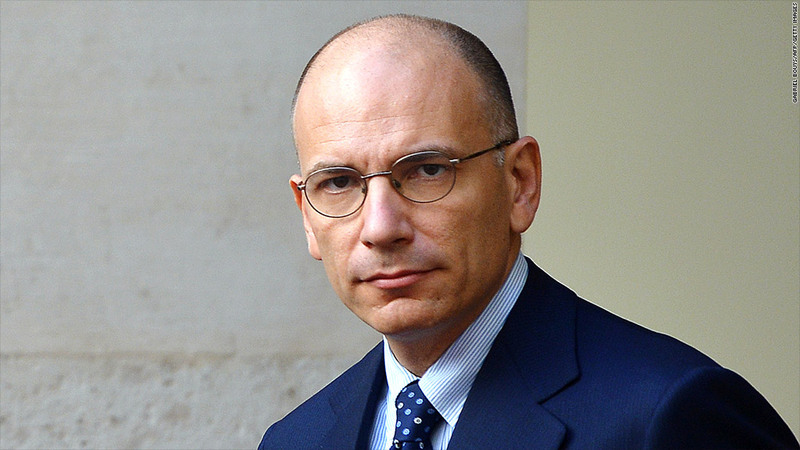 That is up from around 3.9% when Letta took office in April but far from the more than 7% during the peak of the eurozone debt crisis in 2011. Other European markets fell by about 1% as a U.S. government shutdown loomed. The dollar was a shade firmer against the euro. Political instability is nothing new in Italy -- governments tend to last little more than a year on average. But a prolonged period of deadlock could prevent agreement on a budget for 2014 and delay reforms needed to keep the eurozone's third largest economy on track to meet EU-mandated borrowing targets. Letta has scheduled a vote of confidence for Wednesday and hopes to persuade disgruntled members of Berlusconi's party and other senators to back him. Failure would raise the chance of a new election and with it the risk of months of political stalemate just as Italy, and the eurozone, look to secure a recovery from recession. "Snap elections would be the worst scenario for confidence," noted Silvio Peruzzo, economist at Nomura. Italy's economy is showing signs of stabilizing after nearly two years of recession. Tough austerity measures have helped produce a primary budget surplus and a wide-ranging program of structural reforms is beginning to bear fruit. But growth next year will be only a sluggish 0.7% and the country's debt burden -- already above 130% of GDP -- will continue to rise, according to International Monetary Fund forecasts. "To sustain recovery and revive growth, Italy urgently needs further structural and fiscal reform," Kenneth Kang, assistant director for Europe at the IMF, told reporters Friday. Without reform, the recovery will remain stuck in low gear making it much harder to tackle record unemployment of 12% and sustain the budget surpluses need to halt the rise in the country's €2 trillion debt mountain. The economy was brought to the brink of collapse in late 2011, when the cost of servicing that debt climbed to unsustainable levels. That crisis ushered in a technocrat government led by Mario Monti, who introduced a series of tax increases and spending cuts to restore market credibility, then further bolstered by the European Central Bank's pledge to buy eurozone government bonds in return for reforms.